Viva is a free lifestyle and culture magazine aimed at readers in Manchester and Cheshire. Back when the team were just starting out, I visited their small Northern Quarter office to help with some editorial and design work. Everything I've contributed so far can be found below. One of my first tasks at team Viva was to visit the MediaCityUK to showcase it as part of the magazine's regular 'I Love...' feature. I was given a tour of The Pie Factory, the very same soundstage that hosted 'The Royle Family', and by interviewing a member of their team I was able to put together the feature you see below. I also designed each page using Adobe InDesign. 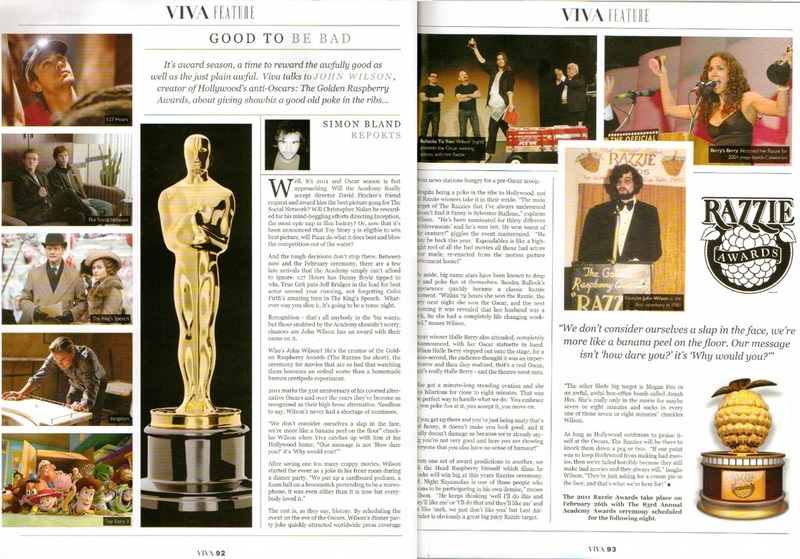 Before visiting Viva, I had recently interviewed John Wilson, founder of anti-award show The Razzies which rewards Hollywood's worst offerings. The Academy Awards were on the horizon, so I asked Viva if they'd be interested in running the piece as a bit of a tongue-in-cheek tie in. They were, so we did. Once again, I designed each page of the feature using Adobe InDesign. I was asked to pull together a piece on the shocking shark finning trade - something I knew very little about. So I gave The Shark Trust a call to find out a little more about this brutal, archaic and wholly unnecessary practice. I designed the layout of the piece too, again using Adobe InDesign. What kind of Manc mag would Viva be if it didn't do a little bit of back-slapping? I wrote this piece highlighting a few of the city's most famous exports and the fame and fortune they've gone on to achieve since leaving the M61.